A combination that enthralled locals and tourists alike, in spite of tonight’s rain. 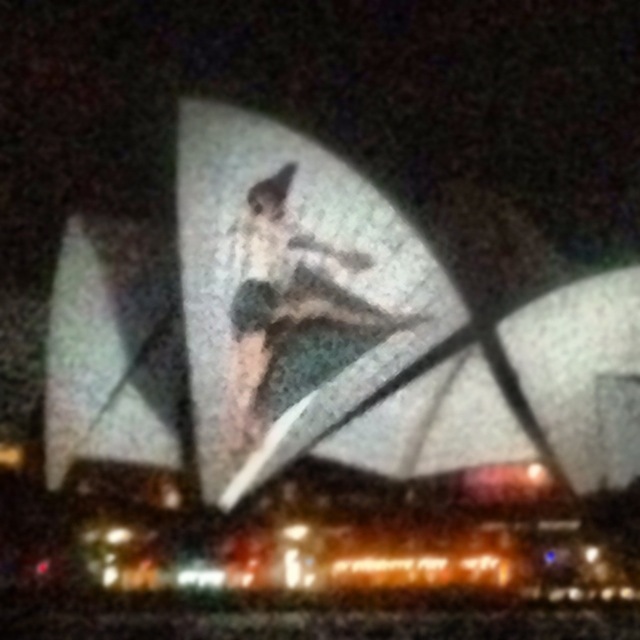 We gasped and clicked away as this projection of a lithe young woman rolled and somersaulted across those famous sails. That’s how this whole visit has felt. It has been a camino of wonders. I’ve laughed and cried, reminisced and rollicked with friends old and new. I’ve talked sins with the charming Richard Glover on Sydney’s ABC 702. I’ve sat in the dark, awestruck and mesmerised, at The Clock – a 24 hour film installation at the MCA. I’ve seen two plays – Les Liaisons Dangereuses and Under Milkwood – at the Sydney Theatre Company. Both of them were peopled by actors I know and love, who gave such pleasure. Yesterday I sat in a rehearsal room down in the Rocks and heard a reading of The Duchess of Malfi, the script I adapted with Hugh Colman. Such delight! It was fast, funny, very furious and charged with linguistic energy that ripped off the page in the hands of a gifted cast. 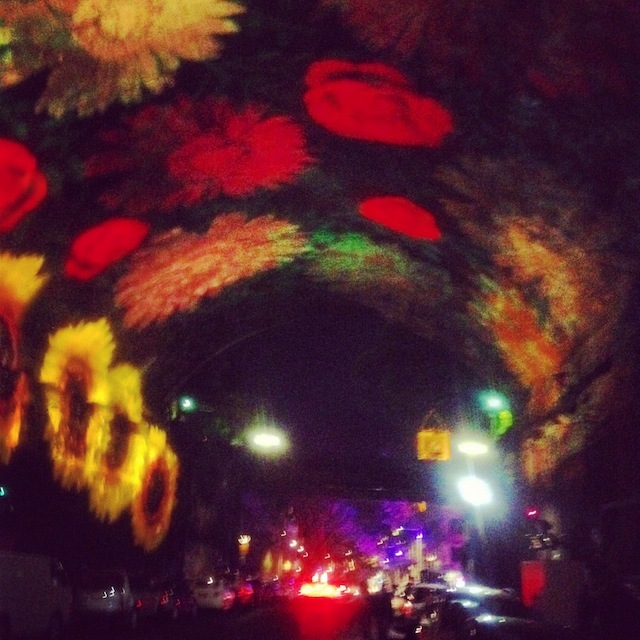 I walked out into the evening and saw this bouquet of wonders, dancing over my head in the Argyle Cut…. And if you’d like to subscribe to these posts, just enter your email address on the top right and click SUBSCRIBE. Finally, do have a look at the tabs on the black bar at the top. There’s info there about upcoming EVENTS AND MEDIA that you may find enticing. ← Why is lust so seductive?